The Oldsmobiles is a Critic’s Pick! The Flea Theater presents the World Premiere of Roger Rosenblatt’s THE OLDSMOBILES. Directed by Jim Simpson, the production stars Richard Masur and Alice Playten. 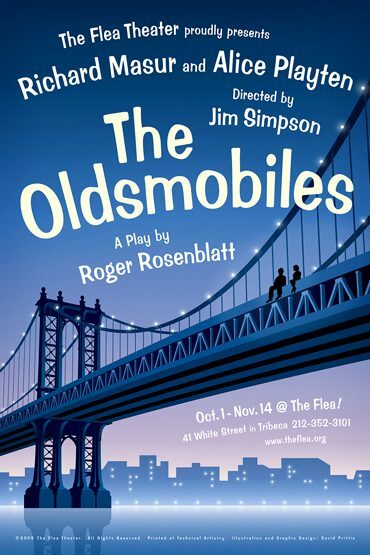 THE OLDSMOBILES is a comedy set on New York’s Manhattan Bridge. Mr. and Mrs. Oldsmobile are perched on the edge contemplating their life together and life hereafter. With the eyes of the NYPD, the fire department, tourists, celebrities, a news anchor, a priest, the mayor, and the Oldsmobile’s children upon them, the couple relish the attention and ponder the possibilities of life and death through Rosenblatt’s sparkling comedic lens. Richard Masur has starred in more than 45 feature films, including Risky Business, My Girl, Heaven’s Gate, Heartburn, Under Fire, and Todd Solondz’ Palindromes. He received an Emmy nomination for his performance in the TV film The Burning Bed opposite Farrah Fawcett. He first appeared on Broadway in 1973 in The Changing Room. His recent theater credits include Michael Frayne’s Democracy, The Exonerated, Rinne Groff’s The Ruby Sunrise at The Public Theater, Mike Leigh’s 2000 Years, and Leslie Ayvazia’s Make Me at the Atlantic Theater. Masur served as National President of Screen Actors Guild from 1995 to 1999. Alice Playten made her Broadway debut as Baby Louise in Gypsy starring Ethel Merman. This was followed by featured roles in the original Broadway companies of: Oliver!, Hello Dolly, George M!, Henry Sweet Henry (Theatre World, Drama Critic’s Award, Tony Award nomination), Rumors, Spoils of War(Drama Desk nomination), Seussical, and Caroline, or Change. Numerous Off- Broadway credits have earned Alice two OBIE Awards, one for her performance as Mick Jagger in The National Lampoon’s Lemmings, and another for her portrayal of Mamie Eisenhower in First Ladies Suite. Film/TV credits include: Ridley Scott’s “Legend,” “Law & Order,” a recurring role on “Frasier,” and forthcoming, “The Rebound.” Alice has been heard on Garrison Keillor’s “A Prairie Home Companion,” and is the recipient of a Fox Foundation fellowship. Roger Rosenblatt is the acclaimed author of essays, books and plays. William Safire of The New York Times wrote that his work represents “some of the most profound and stylish writing in America today.” Vanity Fair said that he “set new standards of thought and compassion” in journalism. His pieces for Time Magazine have won two George Polk Awards, awards from the Overseas Press Club, the American Bar Association, and others. His television essays for the NewsHour with Jim Lehrer on PBShave won the Peabody and the Emmy. His Time Magazine cover essay, “A Letter to the Year 2086,” was chosen for the time capsule placed inside the Statue of Liberty at its centennial. He is the author of eleven books, which have been published in 13 languages. They include the national bestseller, Rules for Aging; three collections of essays; and Children of War, which won the Robert F. Kennedy Book Prize and was a finalist for the National Book Critics Circle Award. He has written five off-Broadway plays including Free Speech in America, cited by The New York Times as one of the 10 Best Plays of 1991, and Ashley Montana Goes Ashore in The Caicos… or What Am I Doing Here?, which premiered at The Flea in 2005 starring Bebe Neuwirth and Jeffrey DeMunn. Wednesday – Friday at 7pm and Saturday at 3pm & 7pm. Sunday at 3pm on October 25 and November 1. The show has a running time of one hour. Tickets $40 (weekdays, and weekend matinees) and $45 Fri. and Sat. Get tickets by clicking the red TIXbutton at the top right of this page. Or, call 212-352-3101. See you @ The Flea!